Capturing all the complexity and grand themes of the original, this prequel to the Dune series weaves a new tapestry of betrayal, passion, and destiny into a saga that expands the tale written by Frank Herbert more than thirty years ago. Frank Herbert's award-winning Dune chronicles captured the imagination of millions of readers worldwide. By the time of his death in 1986, Herbert had completed six novels in the series, but much of his vision remained unwritten. 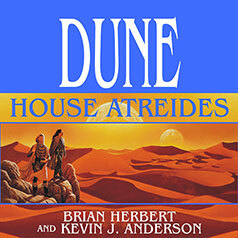 Now, working from his father's recently discovered files, Brian Herbert and bestselling novelist Kevin J. Anderson collaborate on a new novel, the prelude to Dune—where we step onto the planet Arrakis decades before Dune's hero, Paul Muad'Dib Atreides, walks its sands.